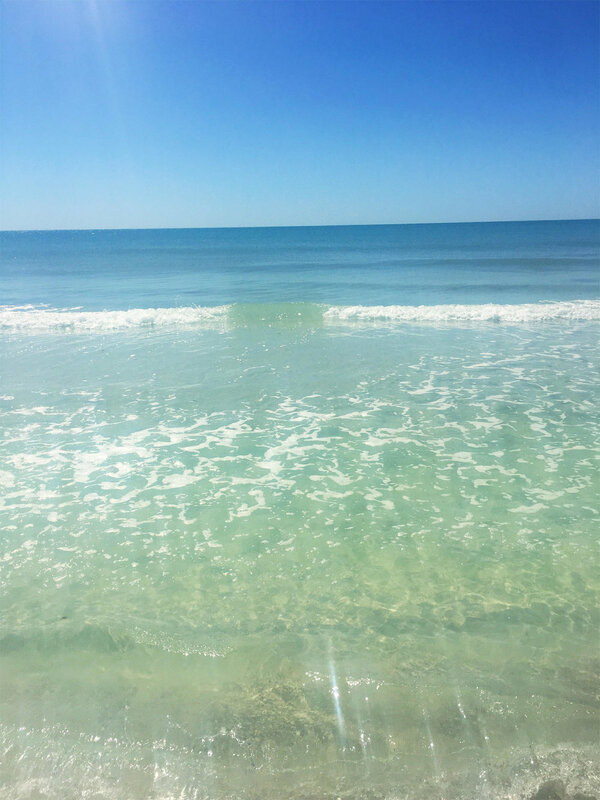 Last week, Chris and I took a trip to Anna Maria Island for our baby moon. As we were on the beach, I realized we've taken a whole lot of trips for weddings, to visit friends and - of course - Kenya - in the last two years, but we haven't actually been on vacation just the two of us since our honeymoon. Ah, how it will restore your soul! We arrived early (early!) Thursday morning and stayed through Sunday evening. The weekend was full of reading (Beneath a Scarlet Sky & The Orphan's Tale for me, Beneath a Scarlet Sky & The Nightingale for Chris! ), tons of long walks on the beach and great seafood. I'm still thinking of the salmon! We held hands. We talked about life. We didn't talk about schedules or logistics or grocery lists. We watched the sunset on the beach. We slept for 10 hours each night. We dreamed about our future. We talked about baby names and whether we think it will be a boy or girl. We talked about our fears, our worries and our hopes. I tell you what, after a long winter, the beach sure will rejuvenate you. I also rocked a bikini, which was very unexpected. I purchased a one-piece ahead of time and had just told my sister I didn't think I'd ever been a woman who wore a two piece while pregnant. But then, as I packed, I decided to throw in my bikini. Why not!? The stakes seemed low enough to wear it with just Chris. After the first day, I decided to take the plunge and throw it on. Y'all, my confidence skyrocketed in that thing. I felt so beautiful and sure of myself. I felt empowered - like I'd come out of hiding since the first day. I felt free. I highly recommend it. For those who are interested in Anna Maria, we stayed at The Waterline Marina Resort & Beach Club. The rooms are all suites, so you'll have two bedrooms and a kitchen, as well as a pull-out couch. It would be great for a group of friends or a family, though it's in somewhat of an odd part of town. It was far more space than we needed! If you're interested in booking, we got a great deal through Expedia, which has up to 10% cash back on Ebates. The Expedia rate (for late February) + the cash back through Ebates made it much more affordable. After we completed the trip, Ebates deposited cash back into my account, which made that beach-side salmon feel much more affordable! :) I mostly recommend the resort (again, the location is a little odd! ), but highly recommend booking trips through Ebates. And now, we're just 53 days away from my due date. Crazy! Six weeks before our wedding, Chris and I cancelled our honeymoon to Tulum, Mexico, because of Zika. We don't have plans for a baby in the immediate future, but knew we'd regret it if one of us got sick and we had to delay starting a family down the road. On a sunny, March day, we sat on the couch with my brother, Duke, and brother-in-law, Ryan, and began researching, four laptops & coffees in tow. Well, where do you want to go, Whit? Chris asked me as he scrolled through Lonely Planet. Without taking a breath, I asked him: Do you want to go to Greece? We'd tossed it around before booking the trip Tulum, but had both agreed we wanted a shorter flight post wedding, knowing we'd be exhausted. But, wanting warm weather + no Zika meant we either had to stay in the US or go far, far away. Within the hour, we'd booked two roundtrip tickets to Athens. I kept saying, oh my gosh, we're actually going to Greece! The quick shift in plans leaving me in a state of shock. We flew into Athens (which Delta now flies direct from Atlanta, badaboom!) and immediately boarded a puddle jumper to Santorini. Our stay at The Mill Houses included airport transfers, which most island hotels do. As we drove from the airport, it felt like we just kept going up and up and up into the blue. We went higher and higher, leaving the ocean behind us as we climbed into the sky. Our driver parked and led us across a busy, cobblestone road. We climbed what felt like hundreds of stairs, winding around corner after corner and then, suddenly, everything opened up to the brightest, white buildings that lined the brilliant blue horizon, every vista overlooking the ocean. I remember feeling almost overwhelmed with so much blue and white everywhere. The beauty was so abundant; my brain couldn't process it. Before we left, I worried all of the pictures of Santorini would get our hopes up too high - edited to be brighter and bluer than they really could be. It was just the opposite. I was reminded that man-made photos can only capture God-made beauty so well. Some things are only meant to be experienced in real time - to be breathed in deeply and to allow our eyes to rest easily upon them. Santorini is one of those places. We spent five nights in Santorini and five in Paros. When we left Santorini, we both felt like we could have stayed another week and still barely have scratched the surface of all the island has to do. The entire place feels like magic. Everything is beautiful and clean, the locals are crazy accommodating and the lifestyle is just as relaxing. Not to mention the food! And coffee! Most days, we found ourselves drinking a carafe of hot coffee in the morning by the pool, then capping off the afternoon with an iced frappe (instant coffee + milk). It was pure bliss. Below are a few things we did + notes about our lodging. We stayed at Mill Houses, in Firostefani, which we could not recommend more. Firostefani sits between Fira and Imerovigli. Many people recommended stayed on the tip of the island, in Oia. While we LOVED Oia, we actually preferred staying in Firostefani. It's quieter and less crowded. I am easily overwhelmed by a lot of stimulation, so I loved being able to experience Oia, but have a little bit more breathing room with our accommodations. At Mill Houses, each room is its own little cave house, with a mini kitchen, table, balcony and loft (if you wanted four to sleep instead of two). The service was incredible and, each morning, they set up breakfast for you wherever you ask. Some mornings we ate on our patio by the pool, other mornings we sat on the edge of the hotel, overlooking the bright blue ocean. It is dreamy. Many, many people told us to hike from Fira to Oia. Almost everyone we met suggested it. What I learned is: 10,000 customers can't be wrong. It was easily the most beautiful hike I've ever done. It is hard to believe this is not hyperbole, but, with each turn, we were even more amazed by the views. We expected, at some point, to think: oh, that's nice. It never happened. Every single time our heads exploded at the bright blue, the sleek, white buildings. Once you get to the tip of Oia, you can descend to the bottom of the cliff, where you'll pass tons of donkeys carrying tourists back up to the top (kind of sad to see). You will pass through little fishing restaurants, which, if we hadn't just eaten before doing so, we would have absolutely stopped. They are quaint and happy, with row boats tied to their docks and big fish hanging over the sea, ready to be cooked. Once you get to Amoudi Bay, you can swim in the Aegean Sea. Since it was only May, the water was crazy cold. It was easily the saltiest water I've ever swum in; we reveled at the way we floated easily. If you swim away from the shore out toward the little island, Agios Nikolaos, you'll find an old, white chapel. It is breathtaking and worth every bit of the cold swim. Watch a sunset in Oia. On behalf of the rest of Santorini, I'd like to set one thing straight: a sunset anywhere on the island is absolutely stunning. You can't go wrong with the cliff views as the sun drops behind the ocean anywhere you go. But! A sunset in Oia is an event. It felt like everyone on the island migrated to the tip of Santorini to see it. People climbed on roofs (of other people's homes, hotels, restaurants), sat on high, high ledges and crammed shoulder-to-shoulder the streets to watch. Chris and I took a bottle of wine and sat on a ledge as we oo-ed and ah-ed. If you're going to attend, be sure to arrive about an hour early to get a spot. If you've grown up going to the Pandhandle in the US, you're accustomed to soft, white beaches. Imagine the exact opposite in Kamari and Perivolos. The sand is black, made of big, hard rocks. The beach is lined with tavernas and shops. We drank coffee by the ocean, while talking about all of the people in our lives we wanted to force to go to Greece because they'd love it so much. We bought a beach blanket, climbed on the big rocks and walked along the shore. You could easily stay at one of the beaches all day - enjoying drinks and nightlife. We did both beaches in one afternoon and found ourselves yearning for a little more time to explore each one. There are a bajillion wines tours in Santorini. We weren't quite sure about doing one - I'm not a huge wine connoisseur (it makes me so sleepy!) and we thought it had potential to be a little cheesy. First of all, the cheese was the best part (was that joke cheesy?). Second of all, we were wrong. The apps, the wine, the views, the sunset! Totally worth it. Santorini produces its own white wine that is super light and wonderful (and, somehow, didn't make me tired). Chris is an exclusive red-wine guy and he even loved it. Again, we weren't sure if this would be romantic or touristy. We loved that we got to see Santorini from a different vantage point and cover a lot of ground quickly - they showed us the red and white beaches and we got to swim in a hot spring, which was amazing. I would say, if it's in the budget, we both would suggest a private cruise. It was lovely, but we both thought it would have been a good splurge item. The sunset gets all the hype in Santorini. But the sunrise is worth a look. Chris and I have a tradition that, on our last day of vacation somewhere, we get up to watch the sunrise. It's sort of painful when the alarm goes off but is always, always worth it. Santorini is asleep until at least 8 a.m. When we got up at 5:30 to watch the sunrise, it felt like we had the entire island to ourselves. The white streets were empty as we listened to roosters crow all across the island. We both felt like we'd snuck something by the other vacationers - how are we the only ones out here? We kept asking. You don't have to plan ahead on activities: There are wine tours, sunset cruises and donkeys a-plenty. Being the planner he is, Chris booked everything ahead of time. We learned that this is not the Santorini way. We could have shown up without a plan for any of it and they would have quickly accommodated. There is no hummus: Am I the only one that didn't know this? Hummus is Mediterranean, not Greek. I learned it the hard way when I ordered it and was promptly told otherwise. So, if you want hummus, go to Turkey. And then eat your hummus with some turkey :) and crackers! I thrive off of routine - off sameness and checklists and a consistent rhythm. It keeps me calm and gives me a perceived (though often false) sense of control. But sometimes? All I need is to break free from my routine. To stop checking things off and to just be. To let go of control and to give up the grind. And that's exactly what last week looked like for my family. My dad planned a 60th birthday trip for my mom, so all of my siblings + their babies headed down to Rosemary Beach to celebrate her. I was fortunate enough that the trip fell between my old and new jobs, so I was able to completely unplug and focus on this beautiful family of mine. Our days consisted of coffee by the pool in the morning, followed by family runs, poolside workouts, Nuke 'Em, ocean swims, bocce ball and, of course, afternoon iced coffee. We talked, we read, we laughed, we ate a lot. Our nights consisted of dinners grilled by my dad, relaxation and early, early bedtimes. Ever since we were little, my parents talked about creating a bunk bed room for us to sleep in together, because we always wound up in one another's rooms growing up anyway. This house made our dreams come true, with two bunk rooms - one for the adults and one for the kiddos. Every night when our 9:30 bedtime rolled around (not kidding), it was so fun to cruise up to the same room. We were lucky enough to celebrate both my mom's, as well as Duke and Ryan's birthdays while we were there. We wanted to shower my mom with extra love on her 60th and, as part of it, we brought Chinese lanterns. We thought we could each make a wish for her year ahead as we let them go. But, even the best laid plans can go awry. And ours did just that. As soon as the first set of lanterns took flight, they bee-lined for the trees surrounding the pool. One lantern made it into the abyss, while the others got caught in the height of the branches. Instead of saying wishes for her year, we were hosing the trees down while praying we didn't light the entire community ablaze. Duke and I hosed the trees down, while Ryan climbed up in one and shook a lantern out. I wish we could have sent off well wishes for my mom, but the memory of us all scrambling and getting ready to stop, drop and roll is a way better memory. I hope you had a wonderful week! There are certain places (here and here, for example) that make me forget where I am. They feel far away and magical - but not foreign or distant. They feel soothing and exciting all at once. They give me pause; make my shoulders drop. This weekend I had the privilege of heading to Seabrook, SC, which is exactly this sort of place. It's quiet and exciting all at once. I went with Chris and his friends from college for a fraternity brother's wedding. As for the wedding? It was beautiful. One of those weddings that makes you say: oh, I'm going to do that. And makes you think: I've never wanted a beach wedding - but should I? The kind of wedding that is elegant, but not pretentious, and honest and true to the bride and groom's style. And the weekend? It was more than a wedding. A true vacation, in fact. When I unpacked, I laughed at all of the real clothes I brought. It turned out my pack list would have been complete with: swim suit, cover up, dress for rehearsal, dress for wedding and pajamas. Our days were on the beach and our nights were dressed up and there was no need for anything more. The company? Was ideal. I felt honored to be Chris' date. It was so much fun to meet his friends and see the way they love and care about one another. They made me feel welcomed immediately. They told me stories about college Chris and grilled me on "how much I really know about him." I felt so fortunate to be part of such an important weekend to all of them. The postpartum? Very real. I'm still reminiscing from the weekend - dreaming of the beach, laughing at everything that happened and hoping that I find myself on Seabrook Island someday soon. I hope your weekend (and week so far) have been wonderful!